Deutsche Bank's chief executive has made an appeal for calm, telling employees that worries over the bank's financial health are vastly overstated. "Our bank has become subject to speculation," John Cryan said in a letter to staffers that outlined the bank's financial position and urged employees to not allow a "distorted perception" from interrupting its business. Shares in Germany's biggest lender plunged more than 8% early Friday after reports indicated that 10 hedge fund clients are reducing their dealings with the bank. But the release of the CEO's letter, combined with a report that suggested the bank will resolve legal allegations in the U.S. for a smaller amount than previously thought, caused shares to reverse course and close with a 6% gain. In his letter, Cryan acknowledged the media reports but said concerns were "unjustified." He said the bank's balance sheet is the strongest it's been in two decades and noted it has more than 215 billion euros ($240 billion) in liquid reserves. "Trust is the foundation of banking," he said. "Some forces in the markets are currently trying to damage this trust." The reports are the latest in a series of body blows for Deutsche Bank (DB), which has $2 trillion of assets on its books. The bank's shares have lost roughly 55% of their value so far this year. It has spent billions to charges that it conspired to manipulate global interest rates and colluded with other banks to rig foreign exchange rates; its margins have disappeared due to record low interest rates and the cost of new regulations; and it has been slammed with a $14 billion demand from the U.S. Justice Department over its role in the global financial crisis. Cryan said in his letter that pressure on the company's stock price cannot entirely be explained by uncertainty over the size of the settlement. Other banks have settled similar allegations for far less than $14 billion. 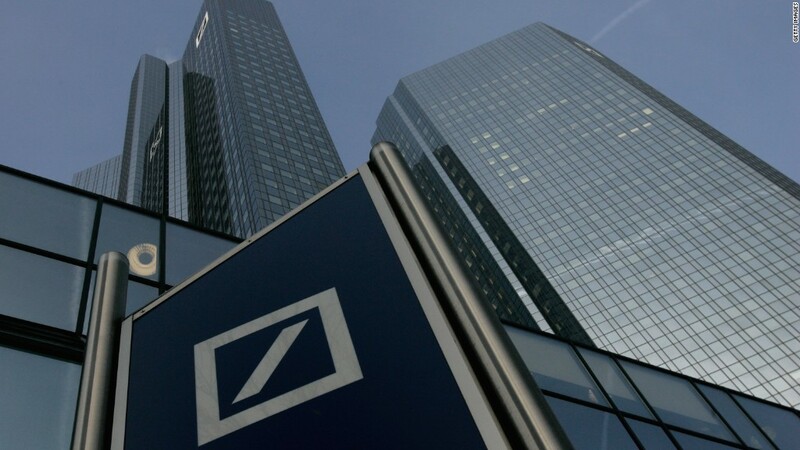 French news agency AFP reported late Friday afternoon that Deutsche Bank had reached a deal to settle the allegations for only $5.4 billion. A bank spokesman declined to comment. German media reported earlier this week that Chancellor Angela Merkel's government was considering ways of rescuing Deutsche Bank. The government denied those reports, and Deutsche Bank said it had never asked Merkel for help. The bank added that it is not currently considering asking investors for more cash. Cryan did not directly address the issue in his letter to employees, saying instead that employees should remain focused. "It is our task now to prevent distorted perception from further interrupting our daily business," he said.